Kevin finally made it through quarantine! It was harder and a lot less fun than we all anticipated and it makes me so glad that he has made it through and can be with the flock. 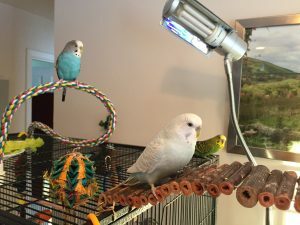 Of course, introducing parakeets can be a tense situation, so the relief at his getting through quarantine was immediately followed by anxiety about merging him into the flock of Toby and Kelly. This was compounded by the fact that Toby and Kelly can be pretty tough customers. They live separately now because of some violent interactions between the two of them and I was worried they would immediately attack Kevin. When we introduced Kelly to Toby we took it too fast, so this time the process was a lot more measured and thought out, although probably still a bit too speedy. First, a few days before the official end of quarantine we started moving Kevin’s cage out into the dining area where Toby and Kelly live for half hour blocks of time. This way everyone could check each other out and learn a bit about the new guy. The change in Kevin’s demeanor was immediate, as soon as he saw other budgies he clearly felt a lot better about life. He was preening himself, making little noises, and eating in front of us. It was like a magical switch was thrown that turned him back into a parakeet! As soon as he would go back into his quarantine room he would go right back into fear mode, unfortunately. After a few days of letting them see each other from the safety of their own cages, we allowed Toby and Kelly to come out and inspect Kevin more closely. This may not have been the best idea, but it worked well in this situation. Toby and Kelly felt like they were in control of everything and Kevin was still so thrilled to feel safe that he tried to pack the preening of several weeks into a 45 minute period. Even when the girls got a little aggressive through the bars he didn’t react back at all, which was perfect. Finally the day came where they could all be out together. We introduced everyone in Patrick’s home office space, a room that no one wants to be in (least of all Patrick haha)! 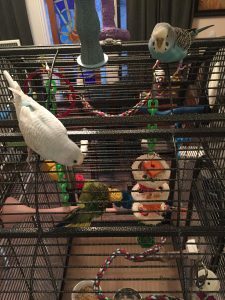 That didn’t last long, Toby and Kelly wouldn’t stay in that room, even with millet, and kept flying back to their home base. We gave up on that in short order and put Kevin out with them on top of the cages in the dining room. It was utterly nerve-wracking! They were SUCH bad girls! Toby immediately chomped on his head and tried to bite his wings. Kelly kept tugging (hard) on his tail feathers any time he was in range of her beak. When the girls began working together to corner him I thought all of my worst nightmares about his assimilating into the flock were coming true! Patrick kept reminding me that they needed to figure out whether Kevin was a threat to them, and also to put him in his place and make sure he knew that they were top dogs. Kevin was perfection, no matter what they did the first day he didn’t react at all, just tried to observe them. He quickly realized that he couldn’t put his back to either of them and stood at the corner of one of the cages watching. He was still quite delighted to be out with them, even if it looked to me like a miserable time! Toby got scolded several times for exceedingly ungracious behavior, and when we put them all in their homes for the evening Patrick and I couldn’t quite sort out whether we felt it went well or horribly! 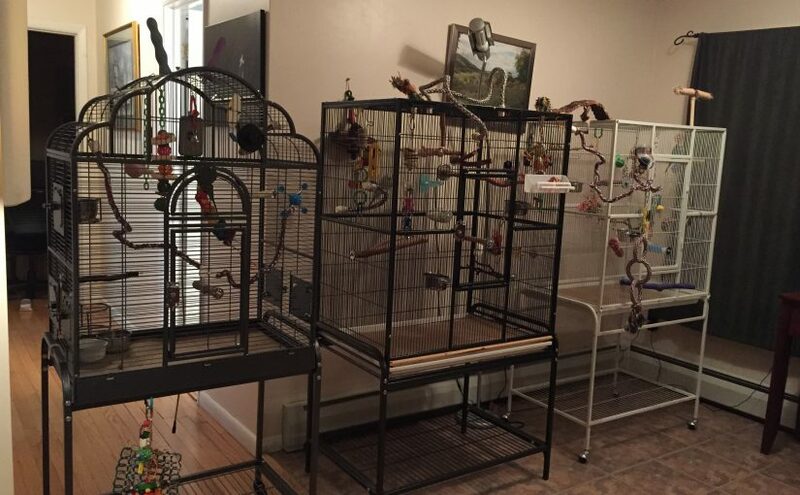 The next day we decided to move Kevin’s quarantine cage into the bird area so they could observe each other at all times. They came out all together again and it did go better, although there was still a lot more violence than I would have liked I could see that they were testing him. If provoked, Kevin would make a small show of fronting back, but not actually fight, it’s awesome. For his part, even if he had to watch his back, the transformation in Kevin was incredible! He was making sweet noises and flock calling, moving around, preening, and acting like the lovely guy we picked out at the pet store. 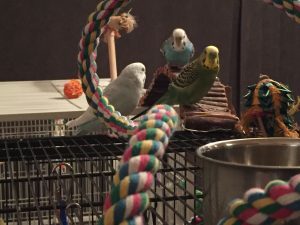 Every subsequent day has been even better, they still treat him a little like an outsider to their girl club, but Toby and Kelly have accepted his presence and don’t try to pull his feathers out (as much). Kevin is a fantastic addition to the flock and we couldn’t be happier with his attitude and his willingness to go with the flow. He and Kelly should be combining households soon and I think it’s going to be great for both of them. It’s a relief to have gotten through the initial introductions with no bloodshed! I’m excited for Kevin to get his flight feathers back so that they can fly together, and for he and Kelly to be roommates, which I hope will be good for both of them. In the last photo I notice a light. Is it full spectrum or heat? Curious what type it is and how you like it. Previous Previous post: The best socks ever – not surprisingly, budgie socks! 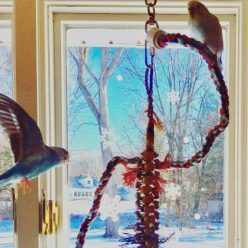 Next Next post: A very budgie Christmas – budgie gifts are the best!